Massive rains and flooding can severely damage your home. In this article, we’ll be talking about some actionable and easy fixes you can employ to waterproof your home and guard it against nature’s damaging forces. Damage due to dampness and water insertion can take a toll on your structure and would require significant repairs. Unlike fire, damage caused by water is gradual and hence, unnoticeable. Water damage builds up over the years. 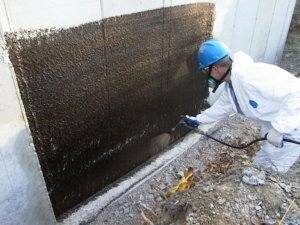 In that period, a small problem that could have been fixed in a day becomes mammoth damage that requires the hiring of waterproofing professionals and spending insane money. Below are listed some easy fixes that you can handle yourself or with a short visit from a local professional. These fixes prevent possible damage as well as add value to your property. The roof is the first part of your house that requires waterproofing, and unless you want water dripping from the ceiling all over your home, you’ll need to waterproof it right. First of all make sure your skylight, if any, and plumbing vents are adequately sealed. Keep a regular check on them before monsoon as they tend to crack over time. Also, check if those shingles are crack-free and if the seals are sealed. As with the foundation, normal measures will not give you complete protection. The concrete used in making your walls can be mixed with waterproofing materials to insulate walls from inside. Also, exterior walls can be wrapped with blue Typar wrap plastics for new buildings. To waterproof older construction, contact a waterproofing expert to see what can be done for waterproofing exterior walls. Cleaning gutters may sound uninteresting but stay aware that protecting the basement of your home is essential. Your drains need to be kept obstruction-free, or you risk water breaking down your basement walls. Also, your sewers may overflow and create a hoard of standing water that can get inside your basement walls. Also, if yours is an older building, you want to make sure that the metal gutters are corrosion-free. Replace gutters if corroded. You might think a foundation as a rock-solid part of your construction, but know that cracks can develop and spread and they are not even visible. Remember that the solid concrete foundation of your home is porous and water can go right through it. The fix is to damp proof and waterproof your basement. Both processes should be deployed together. Now, for damp proofing and waterproofing your basement, you need a dimpled membrane that creates space for the wall to breathe and stop groundwater from coming near walls. However, if you need a robust solution of shielding both moisture and water, fill in existing cracks with a concrete sealant that will require no upkeep in future. Wooden door and frames swell in the rainy season. Also, wrongly installed windows and doors let in moisture. Just by applying silicone, they can be sealed for good or else you could get new doors and windows. Modernising doors and windows don’t just help with waterproofing, but also improve your home’s aesthetics. Thus, knowing what form water damage can take and how, and waterproofing home can add value to it, it is hard to put off waterproofing. While a newly-built home already has good waterproofing, an older home could be challenging to waterproof with dozens of big and small problems that could also cost huge money to be fixed completely. Only by having a professional over to check your home can you know the extent of repairs and upgrades required to safeguard your home from the havocs of water. For integral waterproofing, bathroom waterproofing and new roof waterproofing, use Dr Fixit new home construction range of products.